If you’ve been avoiding booking a bed bug exterminator in Toronto, you’re liking researching the best methods to try and eliminate bed bugs using do-it-yourself (DIY) methods. There are numerous DIY bed bug treatments that are cost efficient and natural, such as steaming, vacuuming, using a bed bug spray, and diatomaceous earth. These methods combined together can certainly put a dent in your bed bug infestation, but it’s still very likely to be only 95% effective. And it’s that final 5% that will cause the most trouble in the long term. 1) Avoid purchasing your own equipment: The main equipment needed for any DIY methods can be costly. For example, an industrial grade high pressure steamer can run upwards of $400. This might be a worthwhile purchase if you are somehow introducing new bed bug infestations into your home once or twice per year, which is not likely. Of course, a steamer on its own can only eliminate any bed bugs or eggs through direct contact, which does not cover anything that is hidden throughout your dwelling. Bed bug sprays are another costly option, with limited success rates. Sprays are most effective when you are able to locate the nesting area(s) and spray directly. 2) Benefit from the impact of a residual treatment application: Of all the bed bug treatment methods, this one is the most important. We have to always assume there will be stray bugs wandering around and/or hidden eggs that are not accessible to kill directly. The pesticides designed especially for bed bugs will cover your entire household for a much longer time frame. Any hidden eggs will hatch within a couple of weeks, and those tiny bugs will crawl across the treated areas and die shortly after. 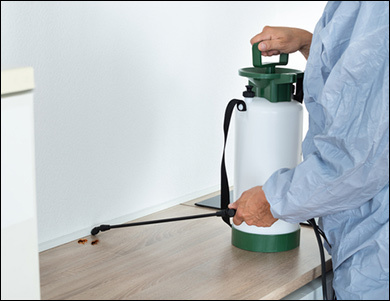 Unfortunately, this is not a do-it-yourself treatment, as only a licensed exterminator can access and use these pesticides. The residual treatment also provides insurance in case bed bugs are re-introduced into your home. 3) Gain access to an expert who’s done this successfully hundreds of times before: When you hire a professional bed bug exterminator, you’re bringing in someone who has likely dealt with hundreds of infestations of different degrees. They have had experience testing out multiple methods and strategies, worked out any contingency plans, and modified their method accordingly. For example, bed bugs in apartments with many units are more likely to be resistant to certain pesticides. This is based on the bugs being exposed to past treatments in other units, then crawling through the outlets and walls to inhabit a new unit. If you are attempting a DIY method, such as a natural treatment or bed bug spray, you run the risk of not using the right amount, causing these pests to build up greater resistance. 4) Be guaranteed that all bed bugs will be eliminated: Having the peace of mind with someone on your side looking out for your best interests (i.e. ridding your home of these pests) is the best outcome in a tough situation. In most cases, anyone with a bed bug infestation is likely to avoid mentioning it to anyone else, due to potential embarrassment. No one wants to be outlawed by their own friends, and not invited into another home based on fear of spreading the infestation. Unfortunately, the tactic of not allowing people into your home who currently have an infestation, is 100% valid. This is one of the primary ways for bed bugs to travel: in someone’s purse, bag, shoes, etc. Getting a guarantee of full elimination is critical, and boosts your confidence that will be able to relax in your home again. And if the infestation is complex, then you’ll have assurance that your exterminator will return to take care of the remaining problem. We hope that these points have provided insight into why it’s always better to invest in a bed bug exterminator vs attempting to deal with the problem on your own. There is little room for error, as each female bed bug can lay up to 500 eggs per year. Imagine what can happen if there are a few leftover, and not killed early enough. Swift-X Pest Control is a professional bed bug exterminator servicing the Greater Toronto area including: Downtown Toronto, North York, Etobicoke, Markham, Mississauga, Brampton, Vaughn, Richmond Hill, Scarborough, Oakville, and Milton. We provide a 3 month guarantee of elimination and will therefore visit a customer as many times as needed to ensure all bed bugs are gone. From our experience, the need for a repeat visit occurs only 1 in 10 treatments we perform and tends to happen in more complex cases. Give us a call anytime to discuss your current bed bug situation, we are always happy to answer your questions and give advice!